Lever Farms will be starting a Community Supported Agriculture (CSA) share program this coming season! Through this program, we, as the farmer, will provide customers each week with a box of farm fresh produce. Each week Lever Farms will pack a box full of the produce that we have harvested that week. We will have boxes for a 10-week period from May 22nd to July 24th. Pickups for your boxes will be every Wednesday throughout this time period (10 pickups total). Pickup location will be at Lever Farms from 8am until 6 pm on Wednesdays. Here is a list of some of the items that you might receive in your box at any given time through the 10 weeks. *Keep in mind NOT all of these items will be found in your box every week, we will use whatever vegetables/fruits were ready for harvest during that week. The cost is only a one time price that will be paid in advance. The registration time period has started now unitl to February 23rd. You can reserve your box at www.LeverFarms.com. Make sure to order your boxes/shares quick, before we reach our maximum capacity of CSA participates for this year! 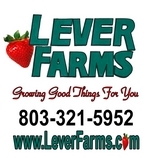 For any questions about the CSA shares you can contact us at levers@leverfarms.com or just call (803) 321-5952.